TORONTO (AP) -- Frank Dancevic beat Croatia’s Mario Ancic 6-3, 6-4 Monday night, to assure Canada of at least one player advancing to the second round of Rogers Cup. Earlier in the day, fellow Canadian Frederic Niemeyer lost in both singles and doubles. There was a tense moment in the seventh game of the first set with Dancevic leading 4-2. Ancic ran heavily into the umpire’s chair while trying to track down a drop shot, and took the brunt of the collision on his right shoulder. He didn’t need any medical attention and quickly shook it. 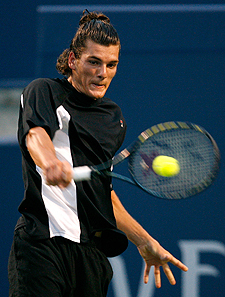 Dancevic, Canada’s top singles player with a No. 82 world ranking, fell behind 2-0 in the second set before rallying to tie it 2-2. Dancevic broke Ancic, ranked No. 24, to take a 5-4 lead before serving out the match. A big reason for Dancevic’s apprehension was missing 3 1/2 months earlier this year with a back injury suffered at the Australian Open. However, he was dominant on Ancic’s second serve, winning 71 percent of the return points. “I knew that just putting the ball back into the middle of the court wasn’t going to do much because he was just going to run me to the other side,” Dancevic said. “Basically, when I had my chances on his second serve I went for it. Dancevic doesn’t have much time to savor his victory, as he will face third-seeded Serbian Novak Djokovic on Tuesday night. Djokovic won this title last year when the tournament was held in Montreal. Dancevic and American Jesse Levine will also play in doubles against Australians Paul Hanley and Jordan Kerr on Tuesday night. Niemeyer was beaten 7-6 (4), 6-1 by Spain’s Tommy Robredo. Niemeyer matched the 12th-seeded Robredo stroke for stroke in the opening set and had eight aces compared to three for his opponent. However, Niemeyer didn’t have any in the second set—and Robredo had four—as his play dropped off quickly and dramatically. “I was a little disappointed losing the first set because I felt I dominated that one and deserved to win it,” Niemeyer said. “At 0-1, I was serving and I had an ad … and I had an easy forehand and he guessed the right side and ended up winning the point. Niemeyer’s misery continued in doubles, where he and Julien Benneteau of France lost 6-4, 6-4 to Switzerland’s Roger Federer and Stanislas Wawrinka. Niemeyer and Robredo began play later than scheduled as rain earlier in the day forced a delay of about two hours. Slamming down towels and throwing balls away, Niemeyer clearly displayed his frustration. At one point, he blasted a ball tossed to him by a ballboy out of the stadium. And Niemeyer didn’t hide his frustration when the match referee called a return by Robredo good when Niemeyer felt it was out with the Spaniard leading 5-1. Doubles specialist Daniel Nestor defeated German tennis legend Boris Becker 6-3 in a one-set exhibition match Monday night. Afterwards, Becker was formally inducted into the Rogers Cup Hall of Fame. In other first-round matches, the ninth-seeded Wawrinka downed Italian Simone Bolelli 6-4, 7-6 (4); 10th seed Frenchman Richard Gasquet earned a 6-2, 4-6, 6-3 victory over compatriot Michael Llodra; 14th-seeded Fernando Gonzalez of Chile beat Benneteau 6-2, 6-1; and German Nicolas Kiefer defeated American Mardy Fish 7-5, 7-6 (4). In final qualifying action, France’s Arnaud Clement, Czech Lukas Dlouhy, Andrey Golubev of Kazakhstan and Americans Jesse Levine and Donald Young all advanced into the main draw. Canada’s Peter Polansky will play his first-round match Tuesday. He faces Levine, with the winner advancin to face second-seeded Rafael Nadal. Also, sixth-seeded American Andy Roddick will open against France’s Nicolas Mahut, who downed Serbia’s Janko Tipsarevic 3-6, 7-6 (5), 6-2.